Save your biggest cloves for planting next year's garlic crop. December is a bad time for me to plan on planting my garlic. Of course I knew this already. The best time to plant garlic is a month or two before the ground freezes. Here in Missouri that means October. In warmer regions, you can plant after the first frost date through early winter. Ideally you want to get good root growth but no top growth before winter, although I've had sprouts shoot up before it got really cold, and they survived just fine. The kitchen garden on Saturday, December 29th. Miraculously, I did actually manage to get my garlic in the ground in October in both 2011 and 2010, but this year my planting plans were waylaid. Then I missed November. 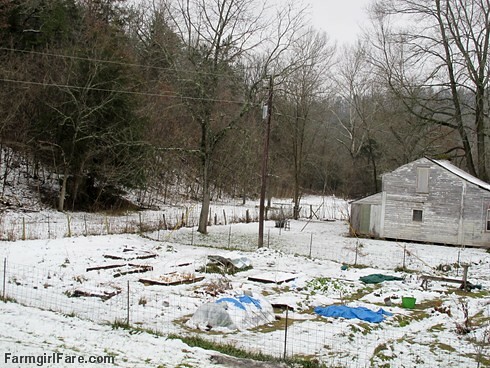 And on Saturday, which was my scheduled December planting day, the ground was frozen and there were three inches of snow on it. Yesterday and today are good planting days as well, except for the old snow and the new sleet. But that's okay. The kitchen garden (and part of The Shack) today, taken from the upstairs of the new house. I'll just wait. I've planted garlic as late as March, and while the bulbs didn't end up as big—because they didn't get their pre-winter rooting—any homegrown garlic is better than none. The other problem with waiting so long is that some of my heads of garlic earmarked for planting (you want to save and plant the biggest cloves from your previous harvest) are already starting to rot. It's okay if the cloves have sprouted (for planting or eating). Mr. 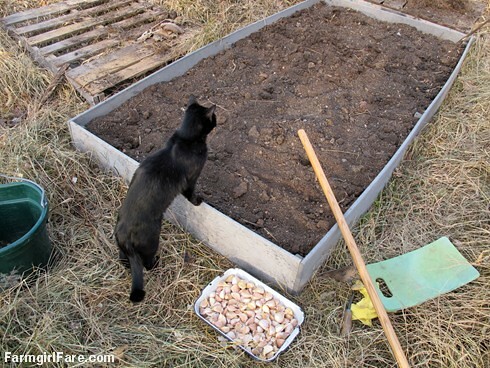 Midnight supervises preparation of a 4' x 8' raised garden bed on October 21, 2011. Depending on how cold it gets (and stays) over the next few months, I may be able to dig into the raised bed I've designated for my 2013 garlic crop in February. Or maybe even during a January heat wave, which we often have. 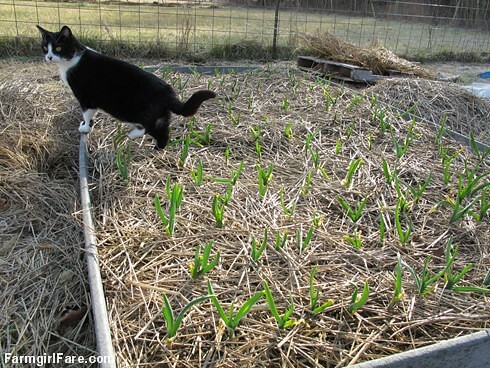 Garlic likes very fertile soil and full sun. If your plants are well fertilized, you probably won't have any problems with pests, which makes it a great crop for organic gardeners. 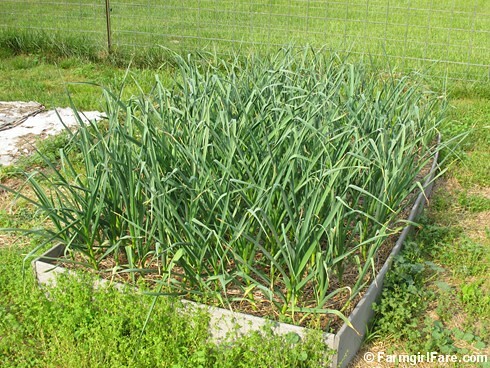 You can actually grow garlic in various spots around your garden to help deter pests. According to my favorite gardening book, The Vegetable Gardener's Bible, garlic should not be planted where you've just grown any onion family crop. Good companions for garlic are beets and lettuce. Bad companions are beans and peas. I use my trusty Korean hand plow (also called an EZ-Digger, and my favorite garden tool for the past 17 years) to plant my garlic cloves about one inch deep, pointed end up, every six inches, in rows that are six inches apart. If you double plant the cloves (like I did in the two left rows), you can—without taking up any extra garden space—grow a crop of green garlic, which is wonderful stuff. You'll find my green garlic fettuccine recipe and more about growing green garlic here. I cover the entire bed with a layer of sheep manure (an excellent organic fertilizer) and inch or two thick and then several inches of hay (I try to use mostly stems the sheep leave in their hay feeders). 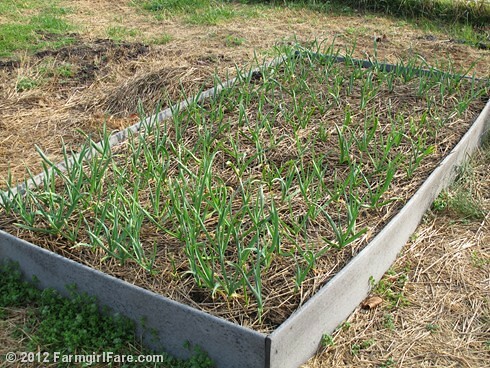 You can also mulch your garlic bed with straw, grass clippings, leaves, etc. If the mulch is really thick I pull it off around late February, but if it's broken down enough so that the garlic plants are all poking up through it, I leave the mulch there as a weed suppressant. Garlic does not do well with weeds. The garlic bed on March 1, 2012. The garlic bed on March 16, 2012. The garlic bed on April 29, 2012. 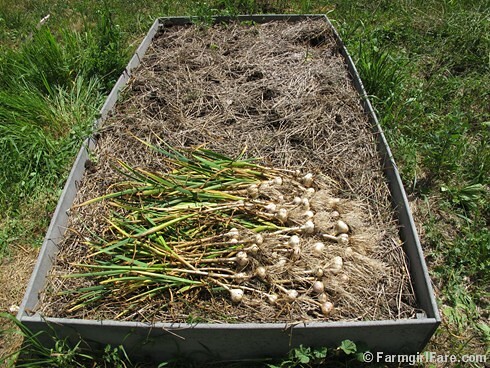 On October 22, 2011, I planted 160 nice big cloves (which weighed 3 pounds, 4 ounces) of my spring 2011 hardneck garlic crop in one 4' x 8' raised bed. Once the plants start growing in late winter, they take off quickly. 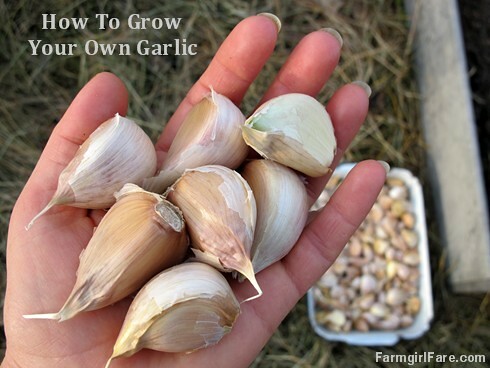 If this is your first time growing your own garlic, you can simply buy some cloves to plant from the farmers' market, which is nice because you can taste them first, or you can order mail order garlic from a seed supplier. There are all kinds of varieties of garlic available, some a lot spicier than others. You can also search for locally grown garlic on LocalHarvest.org. There is no difference between eating garlic and planting garlic—it's all the same stuff—although the instruction sheet that came with some garlic I ordered years ago from Johnny's Selected Seeds says, "The garlic you have received has been grown especially for 'seed,' and has been allowed to remain in the ground for an average of 7 to 10 days longer than garlic grown for consumption." Garlic at the supermarket has sometimes been treated with chemicals to keep it from sprouting. It's also usually the softneck variety (which doesn't send up a scape), and most gardeners I know prefer to grow hardneck (sometimes called stiffneck) garlic, which has a single ring of cloves enclosing a stiff, central stem. The cloves are bigger and it generally stores better than softneck. Once you have your fist homegrown garlic crop, you'll never have to buy any for planting again, as long as you remember to set some of your harvest aside. Store it in a cool, dry, dark place, and don't separate the cloves until you're ready to plant them. The best thing about growing garlic is that it will actually adapt to its location, so as the years go by your strain will keep improving. When the plants send up hard round stems (called scapes) with "topsets" on top in late spring, I snip them off to encourage bulb growth using my beloved take-apart shears (I use these so much in the kitchen and garden I bought a second pair). I dug my garlic plants up up (again using my trusty Korean hand plow) on June 6th, which was a few weeks earlier than most years. The bulbs would probably have been bigger if I'd thought to water the garlic bed during the spring drought. The best time to harvest garlic depends on where you live and the weather each year. In some places you let the plants turn completely brown, but here in Missouri mine is ready when only about a third of the leaves have started turning yellow. If you leave your bulbs in the ground too long, they'll separate and rot. The best way to check if your garlic is ready is to simply dig up one of the plants and see if the cloves are fully formed. Garlic curing in the greenhouse. I let the freshly dug garlic cure on a screen in my homemade greenhouse (you want it out of direct hot sun) until the skins are dry and the necks are tight, about two weeks. You can eat your garlic right away, but if you want to store it for a while, you need to cure it. I know I weighed the final harvest, but I have no idea where I wrote the total down. Garlic is one of the healthiest things you can grow. As for what to do with your beautiful homegrown bounty, I say pretty much anything that doesn't have chocolate in it probably needs some garlic. Is your garlic in the ground yet? Any garlic planting tips, growing stories, or favorite recipes to share? 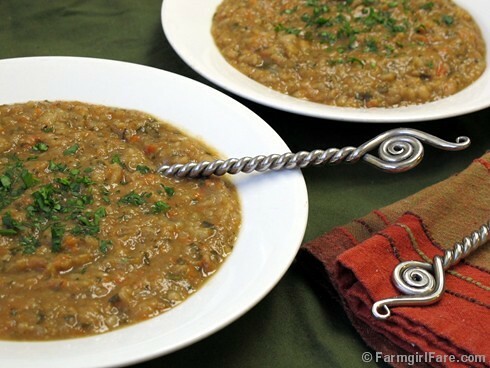 Two of my favorite recipes that call for lots of garlic are this Roasted Garlic Lover's White Bean Soup (it's cheap, easy, healthy, vegetarian, vegan, and fat free!) and this simple Pasta with Olive Oil, Garlic, Pecorino, and Parsley. 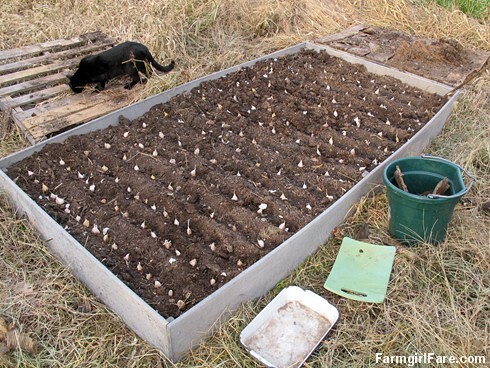 10/22/10: It's Time to Plant Garlic! © FarmgirlFare.com, where Farmgirl Susan shares recipes, stories, and photos from her crazy country life on 240 remote Missouri acres—and there can never be too much fresh garlic. Happy New Year! Enjoy some of that snow for me! Hello Garlic Girl! Sorry you don't have your garlic planting complete yet, but I am certain you will have a warm spell and quickly toss it into the ground soon and it will thrive. I planted it for the 1st time last year and am LOVING the harvest. I did get lucky and get this year's Fall crop into the ground and am pretty pleased with myself :). Susan, you remind me so much of my best friend. I fell in love with her when she came to visit my untidy house and as I apologized for its clutter, she admitted that as of April, she still had Christmas decorations in her living room. Been my best friend ever since! I love too how your plans are sometimes bigger than your time/energy allows. Makes me love you even more :)! My mom and I used to shop in Southern California nurseries and buy the most amazing plants and take them home and not get them in the ground. We began to call them B & Ds, buy and die. Sad, but true... and funny to me. Oh my, didn't mean to ramble. Better go stir my split pea soup. No garlic, but still smells great! Happy New Year dear Farmgirl. Stay warm. 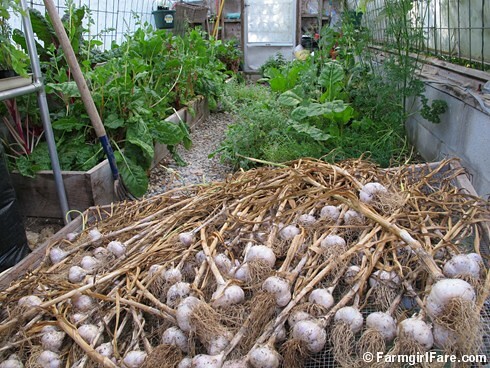 Never tried planting garlic but wondr how well it would grow using straw-bale gardening. I got mine, but never got it planted. Right now I have 10" of snow, but they're predicting temps in the 40's next week with rain. We also get a January thaw, and I think I'll wait until then to plant both the garlic and the shallots. We are notorious for planting our garlic late---October just seems to be a busy month with the sheep and the winding down with vegetable growing. One year we planted the week after Christmas into freezing/icy ground, scrambling to get it covered before the ground (and fingers) froze, and it all came up! Last year it was rainy and cold while planting---we joked that the mud mounded over the beds were adobe structures---it all came up and was one of our best years. This year the ground was perfect but it snowed before e got the mulch in place---the snow will act like mulch for now. Good luck and I hope you get it in soon. Got my garlic (organic) into the ground in early November. We had a warm fall. Crop didn't do well last year (son planted), but the year before it was great. I'm in Massachusetts and have a tiny condo garden. Hoping for a decent harvest. Snow on ground in Massachusetts. Finally getting winter. As usual, my indoor rosemary up and died. I got my garlic planted in October, all covered with compost and rice straw, like a good little gardener should ;), and then we had a warm spell and it all sprouted. Then we had several December freezes. And even though our annual rainfall averages 60+ inches, I do water on non-rain days. I am going to plant more garlic during our January thaw for harvesting green garlic in the spring. Thank you for the tip about not planting them in a previously sown onion bed. I had no idea. You are always an inspiration, Susan. Wow.. to me, it sounds like you've planted your garlic early. I live in NE Ohio right on Lake Erie and I dont get mine in the ground until the very last of October or even late into November. I plant right around 200 cloves myself. I think garlic is pretty forgiving to be honest.. And if you've got it covered with hay or other similar mulch, its got a nice insulating barrier on it so I would imagine your ground doesnt truly freeze as much as you think it might. Hope you get yours in sometime soon & you have a bumper crop! I had my garlic planted ok but had 2 huge yellow jacket nests under them, I couldn't get near them, we tried everything....:( We dug them out mid dec after it frosted and they went in, they were the size of beachballs.. now I don't know what will happen this year, or if they come back. We will see... Happy New Year and I love your blog!! My garlic is in and growing and I'm hoping that THIS year, when I dig it up, it will be braid-able. I grow softneck varieties (Silver Rose) just for this purpose because I'm a nerd who likes to braid vegetables. Before I was just a nerd who planted WHOLE HEADS OF GARLIC LIKE A LOSER and then, when I went to dig it up, realized that I was a dumba**. Ah, live and learn and then read the instructions. I will have to add a few garlic plants to my backyard patio garden. Finny you should try some hardneck varieties---they are braid-able too and I think you will love the garlic for eating. It is a different sort of braid (probably a you tube video somewhere showing how) but looks great in the end. Softnecks do OK in California compared to the East but what do you do with all of those little cloves in the middle:)! Love your sense of humor (and your shower tile!)! Great post! Informative and I love the photos. 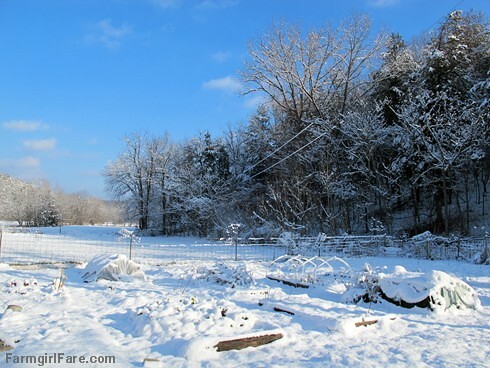 We had a snowstorm last night so our gardens today look a lot like yours in the first picture. We're in southern Virginia and I try to plant garlic in October. Last year I mulched it with straw, but the wheat seed in the straw germinated and I had to pull all the straw back and weed (by hand) a very large garden of garlic. Not fun. This year I have weeds in the garlic. We're not using a raised bed for it so I cultivated repeatedly to make sure all weeds were eliminated before planting. But it was so dry that the weed seeds weren't germinating. They were just getting tossed around by the cultivator. I should've watered the garden, let the weeds emerge, then cultivate. Lesson learned. Still, I'm sure we're going to have lots of great garlic. I often tell folks it's one of the easiest things to grow and a great way to get started gardening. I'd love to know what you are planning for your garden this year, what seeds you have saved, or are buying. The seed catalogs are here and taunting me. Eeek! I didn't get ours in this fall and will be scrambling this week to get some in the ground. At least we will get some garlic greens I suppose. Love your blog! It's been my favorite for a couple years now and yet I've never commented. Just got my first order from Pinetree and love how many seeds we got for the money! Susan - our kitchen garden was still under snow just a few days ago and I couldn't even plant readishes, as the ground was so frozen! However, the weather looks promising today, so who knows! We might even let our flock of 5 chicken out!! !